It left pretty much the same way it came ... discretely. Looking back now, one can see the seasonal musical high and low points and wonder, whether this year will be any different. Last year's "Black history Month" celebrations were clouded in uncertainity. Only the almost daily appearences by local black groups at Junction bar in February gave one any sense of Black History Month as used to be in foregone times. African Dance Records then splashed up the Arena in May with a mini Reggae Fest. Bands on the line up included Hypnotix outta Prague, Livin' Spirits and Makwerhu. For once the PA was good. Reggae Lovers turned on en masse, and the bands really gave us our moneys worth. Good show... Livin' Spirits presented their new lead singer Tikiman from Dominica. Third world also played the Arena in May. Yaam was at it's usual best when the sun chose to come out. Always the right place to be, with all there is to ensure good vibes. However we are aware of the fact that in spite of efforts, this place has now been relegated to history.....too bad. Local promoter Barry worked hard to ensure a packed Pfefferberg on August 3rd to celebrate Jamaican Independence. Local reggae artist Ras Donovan featured together with Berliner singer Mojo Manny. Spengman was there from London and did thrill the drowed with his presentation. The Hamburg-based Bass Culture Band closed the night with Marley tune after Marley tune interspersed with some of their own compositions. On first sight it would appear that this article attempts to polarize the listeners and enjoyers of reggae.Not so. No one is pure Black or pure White and we all come from one source. Now that reggae has been around the world it has been tainted (positively) by the different contacts it came into.Hence today there are Japanese reggae groups and Bob Marley's music can be heard on almost every corner of that planet. U.B. 40 made it to our ears and will always be remembered as a mostly white-membered reggae band. Captain Marley's son set something in motion that not just changed people's musical tastes but also helped forge a closer tie between the peoples checking out this new musical form. Almost every place in the world has its reggae Club or Bar or Concert place. In Berlin it used to be 'Empire', 'Village' or wherever the local community could meet, talk, smoke etc....Not to mention the eventual what happens next....talk talk....smoke go....together.... Marry......Papers!!!! Next thing you know....Baps!!! Children..... Many European women find themselves in a cultural limbo after a couple years' association with black men. Refused by their own as 'betrayers' and not accepted by the others because they are different, one can only wonder whether the world 'future' is part and parcel of their everyday mental dictionary. Some reggae artists even go as far as hammering away at the walls that seperate blackness from whiteness. Greetings ! Today we live in a world of advanced technological tools which have I think the purposeof getting us closer to each other. The globalization of everything affects everybody whether they are concious of it or not. Music and Reggae have been no exception, and we've had to deal with our share of the technological onslaught. Gone are the days when the police had to come quiet down the aspiring drummer in the next apartment. That does not happen anymore. 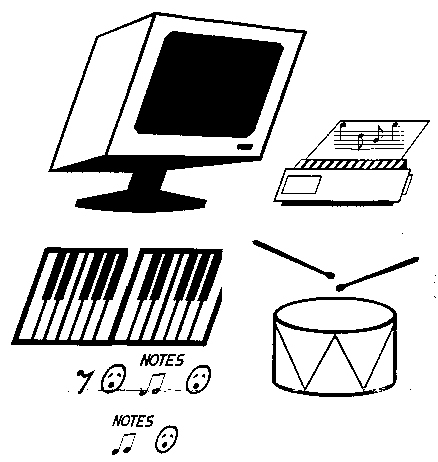 "Drums" are now played by computers in the majority of today's marketed music. Who cares anyway ? As long as it sounds okay, n'est-ce pas ? Whatever name we choose to give to "modern" reggae....dancehall, ragga, peppaseed......it is clear that 'things are not the way they used to be'. Lotsa idren still record with trapsets; it's all a matter of choice and/or knowledge. More on this issue is discussed on page "three". Some people have an aversion for artists like Muta who push mercilessly on sicio-political issues. Since what matters in the end is what one really thinks, it's good to know that music is one of the things capable of bringing all peoples together. Reggae music in particular has had an unquestionable effect world society and we know of too many cases of clashes within the 'family' due to some form of intercultural contacting...spliff.,.locks etc...In the same vein there exist a vast majority of continuing inter-cultural harmonious togetherness. Music is music and life is life....as long as there is one there will always be the other. Better overstanding of our own culture will enable us better to appreciate and learn from that of others. Frustrated by meager attendance at Reggae concerts and hit or miss service by Reggae labels, Papa Pilgrim of Salt Lake City and Rastaman Nané of Grand Rapids, Michigan, Formed Reggae Ambassadors Worldwide in the summer of 1992. Nané, a concert promoter, and Pilgrim, a writer, are both Reggase radio DJ's. The history of reggae has its roots in Universality, and further insight into is dealt with by taking a close look at the Black and White reggae Community, and not only Berlin's. Father Rasta mother European is a pattern that we have all gotten used to. Reggae music has always been wary of 'isms' and the cry for African Liberation must remain its dominant theme. There is a house on Wilhelmstr., named after Tommy Weissbecker. Who he is or was may not be known to many, but everyone who knows this place has his, her or its idea of what it is supposed to represent. We get the inside story from those who are responsible for its maintenance and questionable future survival. Reggae Ambassadors Worldwide is an international network of Committed Reggae Enthusiasts who have joined forces to spread the positive vibe of Reggae music. RAW has grown from two to over eight hundred members all over the globe. We will be keeping our readers in touch with RAW business including membership application etc..Enquiries about RAWcan be addressed directly to 'the Dreaditor'. As we proceed, I'm sure that we will have to adapt with the changing times; but this paper plans to remain independent, private and clear of outside influences, manipulation and control. must make it work. So right !! Anyone who has an inkling as to what it takes to "build a riddim" will understand that all these devices are just tools and that the real thing comes from good interaction between people. A limitless track studio with all the latest tricknological gear is only o.k., if the "players" are in a real creative spirit. Little bit of tracks in underground smoky cellars with the right vibes can also give good results. Today there is no rush to go into studios. They are all available and they are desperately looking for customers. "Wheel !!!!!!!!" is not just one of man's earlier inventions. It's also one of the first things you hear from a DJ/artist when does not start right or if it's really nice. Come again... Still it's a big world and there is room for everything. We can't predict the future, but I think it's safe to assume that by the turn of the century we will be asking ourselves the same question "Is it Raggae or Reggae ?" Once again time cannot tell. It was named after Thomas Weissbecker who was shot by the police, shortly after its occupation. Weissbecker was know in the Berliner Blues and Provo scene and later joined the RAF. The naming of this buildimg thus at that time was a provocative signal against the oppression of counter-culture with police violence through state apparatus and the expression of the solidarity within the leftist movements. In the beginning of the 70's, youth and student groups began occupying empty houses all over Germany. They made demands for self organised youth centers and wanted to create alternative communial living styles against the backdrop of another town planning policy. One of the first houses to be occupied in Berlin in 1973, was the war damaged one on Wilhelmstr. 9. The occupiers wanted to create a social living project in the long standing empty house especially after having diverse bad living experiences. Problems with parents at home, runaways, and the most of all those with problems with the 'law'. Their goal was the establishment of a communal living project. This solidarity with leftist movements in the first years led to brutal police attacks involving the destruction of the interior protions of the house and hassles against ist inhabitants which even caught the attention of Amnesty International. Emotions cooled off as the years passed by and the house's status was legalised through a 'Landlord/Tenant Contract' with Berlin City Authorities. TWH was the only building in the south of Friedrichstadt to be restored by its inhabitants through self-help work. The year 1996 was not just all concerts... three new CDss surfaced on the local scene. In April, Ras Perez came out with "Over the Hills of Dominica". This is a one of a kind album. The artist plays all and does all the singing and besides, no drum machine !!! Drumset sound and no Rock-tinged guitar. Something for the purists at last. Ras Perez also played a series of concerts be seen everywhere. A seperate article dealing with artists' profiles will feature Ras Perez and other local musicians in subsequent issues. Releases also came from Makwerhu (Mini-CD) and 'The Duke of Earl' (sic) (Full lenght CD). For over a year now Kiss FM's Natty Irie had been changed to 8-9 pm and the people don't like it and would love to have more reggae radiotime. What is really going on I guess only Natty and the Kiss FM people know, but there are two sides to a coin and people should be informed about what's up. Still, on Sunday nights, 8-9 p.m., one can tune into Kiss and get at least one hour of Natty's Reggae. Local promoter Sister Ann also did sessions at SFB Multikulti every third Saturday afternoons. Good vibes. Towards the second half of the year we had the usual Top nema visitors to check out. Ziggy, Buju and Macka B among others. All passed and did their thing to the delight of the local massive. Local Berliner Soundsystems had no time to spare or waste last year. Concrete Jungle and Urban Bass constantly keep the vibes going on weekends. Flyers advertising the "Dub Club" always seemed to end up in one's possession. Black scorpio and Sound Dimension also kept things going. Berlin's Black Liberation Sound kept up regular Friday night stints at Öntököltöröll on Hohenstaufen street, with Selectors Hafis & Kiki keeping the vibes nice and smooth. Finally, the musical event of the year to me was the celebration of "Fete de la Musique" on July 21st . As in Paris, music could be heard throughout the city that day. Live bands all over the 'Platzes'! !, even on trucks!!. The only thing that stalled the scene a little was the off and on drizzle and the fact that it was a working day. Let's hope that it will be even better this year. So....with 1997 getting off to a good start and looking back at last year's surprises, dissappointments, hopes, ambitions and achievements, one will tend to agree with me that it was indeed a Perry Good Year. Joining forces, they brought to frution a seed planted some 5 years ago by Inner Circle's guitarist, Roger Lewis. Lewis, recognising that there were committed Reggae enthusiasts all over the world, suggested to Papa Pilgrim that these enthusiasts link up to form a massive Reggae network. Such a network would serve the best interests of the singers and players as well as the Reggae industry as a whole and act as a vehicle to move Reggae music to higher heights of popularity. "People do not know it, but before reggae I was a Rock an' Roll singer". Did you know that it's cheaper to buy chemicals after dark ? Reason: The night rates are cheaper than the day rates ! "I smoked but didn't inhale". "All my songs are boys." "The band was a trio, but we get a new keyboarder, so we playin' now as a four_O". change for a better not for a worser". Before starting out and going on stage, aspiring artists should try to learn the basics of music. "After dat song we takin' a spliff break".